This report has appeared in various Russian language outlets. Your Fort Russ staff has chased down the French language original. On the Ukrainian front, blockades and corruption stir hatred. The proliferation of checkpoints to filter the passage of people and goods to the separatist “republics” angers residents and tarnishes the image of Kiev. Over the period of six days, “Le Temps” takes you along the frontline that divides Ukraine to meet the actors and victims of this crisis. Under a blazing sun, a young woman, in tears, walks up along the column of cars blocked by the Ukrainian army. The first hospital is thirty kilometers. But with the war and the security checkpoints, who knows how long it will take to reach it. Near the end of her pregnancy, she asked a favor: Could she leave the “rapid” line (reserved for the sick and families with children) to go first? Dry refusal. The soldier with a machine gun pointed to an ambulance. – “No dying here. People die on the other side.” The other side, where she comes from, is the territory managed by pro-Russian separatists. On the Artemisk-Gorlovka road, going from Ukrainian government control to the “Donetsk People’s Republic” (DNR, self-proclaimed), the waiting at checkpoints can last for hours, each way. We are in a region where the boundary is the entire front line that splits the country in two. An area where arbitrariness sets in, where humiliations are frequent, where corruption and trafficking flourish. In eastern Ukraine, it’s officially the the time of armistice. But the cease-fire is violated daily. Since May, the exchange of fire is frequent, weapons are massed along a line taken by the Minsk agreements, raising fears of a new outbreak of violence this summer. Kiev accuses Russia and the separatist rebel territories of preparing a “total war.” The separatists say they’re responding to the provocations of Ukrainian fighters. Moscow denounces the “bad faith” of Kiev and its Western allies. Europe and the United States point the finger at Russia, pouring weapons and fighters into Ukraine. The climate is oneupmanship. From Gorlivka to Mariupol, through the western suburbs of Donetsk, troops are digging trenches across the newly plowed fields. Construction materials — logs, cement, rails, concrete anti-tank blocks — are piled alongside backhoes that are tracing the furrow of a Donbass Maginot Line. It could stretch over 500 kilometers. In places, there are bunkers of stacked up sandbags. And both sides mine the land around the strategic axes. In this conflict, which has claimed more than 6,400 dead, artillery plays a central role. But soon, this could become a war of trenches that could settle in the margins of Europe, a century after World War II. 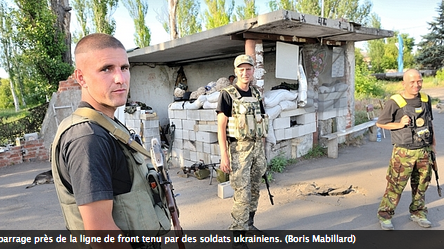 In the Ukrainian official language, they call it the anti-terrorist operation zone or ATO. “This is not a civil war or a war against Russian speakers as stated by the Russian propaganda, but a police action against the terrorists,” said Colonel Valentyn Fedichev. Because of this combat Kiev decided late last year to stop the payments of pensions and freeze the banking system of the separatist side, as well as to restrict trade, to ensure that this money is not diverted to the leaders of the rebellion. Moscow and the separatists call it economic blockade, pure and simple. These are the barriers that feed corruption and smuggling. Sergei, a businessman, tells us about a truck carrying five tons of chicken at a Ukrainian check point. After negotiating, three soldiers on duty agree to collect three hryvnias for every kilo of chicken, or a total of 45 thousand hryvnas (about 2250 francs). Valentyn Fedichev does not deny the problem. “The police are tracking down the rotten elements and punishing those guilty of infractions. But the corruption is linked to a few individuals, it is far from the rule in the army, nor is it systemic.” Two officers were arrested. At the check point Horlivka, soldiers check the number of cigarettes and the amounts of money (10,000 hryvnias per person maximum).